No work today and beautiful sunshine. My husband and I wandered through a fantastic Picasso lithograph exhibit at Helly Nahmad Gallery and then I stopped 10 blocks from home to add a page to my NYC Journal. This really interesting little store has a very narrow facade, and is squeezed between two large buildings on E. 78th St. 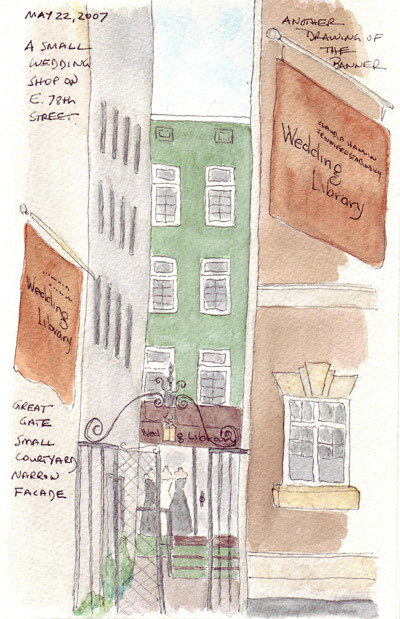 The large banner attracts attention from Madison Avenue and the very sedate sign next to the gate says that it is a "unique, chic haven for brides." I continue to practice figure drawing and my Yoga Book was the inspiration for this quick sketch. I don't "do yoga" and never have - so I only know that this is Shoulderstand Cycle from the figure legend under the photograph. My husband is watching me type all of this and just said "That is a better foot!" 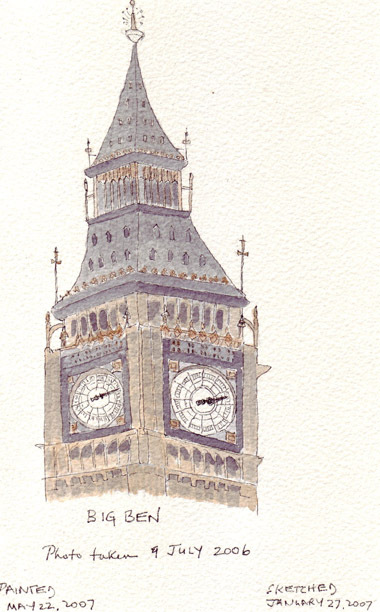 I certainly hope I am improving, if only a minute amount with each sketch! Another rainy day in New York City so the Sketchcrawl group switched the location from Southstreet Seaport to the Metropolitan Museum of Art (my 4th trip this week!). 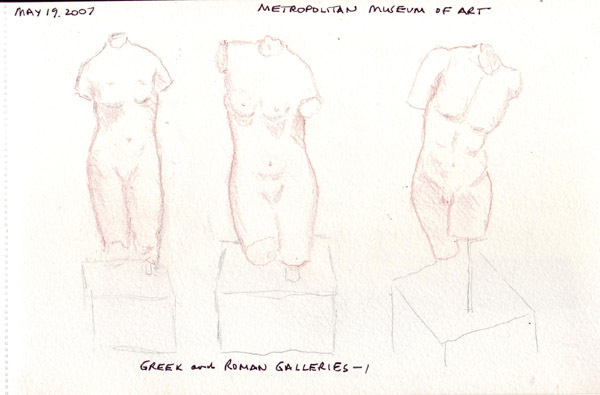 We spread out in the new Greek and Roman Galleries and sketched - ancient sculptures and visitors. I was really happy that Paula (an EDM member from Brazil who I met last Fall) joined me. We had fun catching up as we sat on one of the many benches that are scattered throughout the beautiful sculptures. 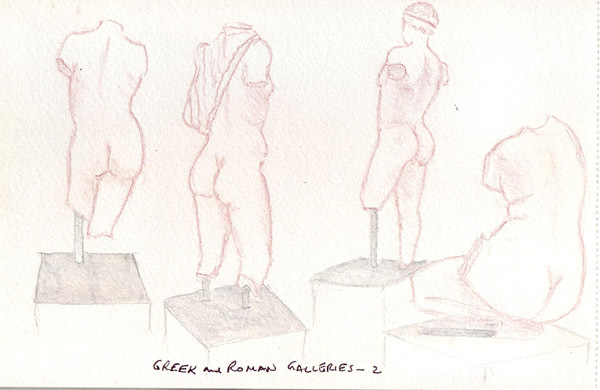 Since I really want to learn how to sketch figures in 2007, I used this opportunity to sketch as many sculptures as I could before we went to the Museum cafeteria with the rest of the group. I loved the fact that none of these sculptures had heads, hands or feet. I'm not up to those lessons in my self-imposed curriculum yet. These sketches were done with a Faber-Castell Polychromos pencil in a Moleskine watercolor journal. We had another bad weather Friday in New York City. So we took our grandson back to the Met for the second week in a row. 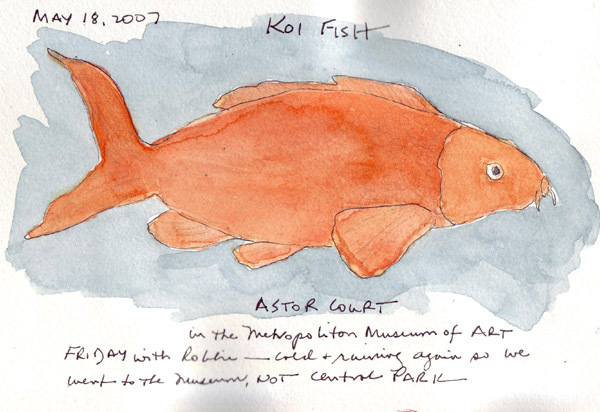 This week we visited the Astor Court in the Asian Art Galleries to show Robbie the pool full of Koi. While he was enjoying the Courtyard and periodically returning to the pool with my husband, I sketched one of the swimming fish.